Marc-Andre Fleury has been a controversial and polarizing figure during his time in Pittsburgh, to say the least, but the fact that he's having a career year for the Penguins is beyond debate. In his first year playing behind Mike Johnston's new system, and second season working with Mike Bales, Fleury has set personal bests across the board, and he's been rewarded for his play by being named to the All-Star Game as a replacement for Pekka Rinne. It's a well-deserved honor, and after the jump I'll take a look at exactly how this year stacks up against his career, as well as the rest of the league. Marc-Andre Fleury's 0.926 save percentage and 2.16 GAA would each rank as career bests for the 30 year old netminder, topping his 0.921 save percentage in 2007-08 and 2.32 GAA in 2010-11, while his 6 shutouts are already more than he's had in a single year. His numbers also stack up more favorably against the rest of the league as compared to previous seasons. 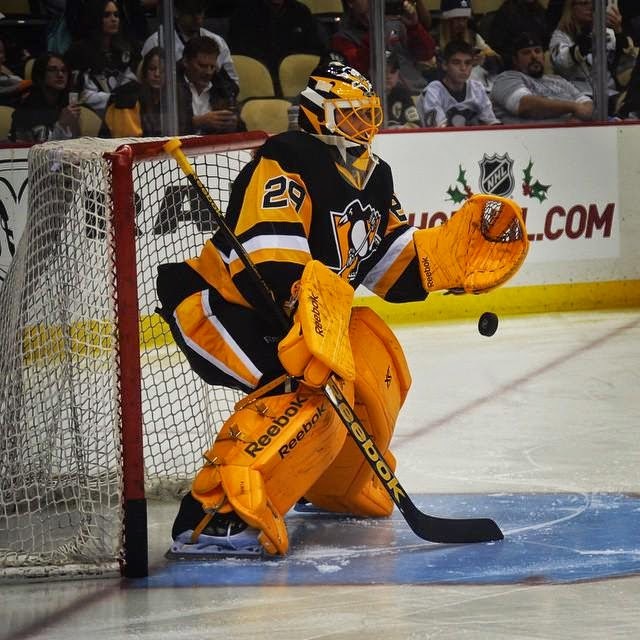 Fleury currently ranks 6th in both save percentage and GAA among goaltenders who have played at least 1,000 minutes after finishing 13th in GAA (2.37) and just 27th in save percentage (0.915) out of 55 goaltenders who played at least 2,500 minutes during the previous three seasons. The trend of increased production also applies to situation-based stats as well. At even strength so far this year, Marc-Andre Fleury is posting a respectable 0.928 save percentage, good enough to rank him 8th out of 29 goalies with over 1,000 minutes 5 on 5. This is after ranking just 37th out of 56 goalies with at least 2,000 minutes at even strength (0.919) during the previous three seasons. He's been incredibly good on the penalty kill, 2nd out of 33 goalies with 100+ minutes shorthanded behind only Semyon Varlamov with a 0.933 save percentage. This is after already being incredibly productive when the Pens are down a man, ranking 4th in save percentage on the penalty kill (0.896) out of 51 goalies with 250+ minutes shorthanded from 2011-12 through 2013-14. Another way to assess Fleury's performance this season is to break out his statistics into different areas of the ice. War on Ice breaks down the ice into three zones based on Fenwick shooting percentage: High Percentage (>10% Fenwick shooting percentage at even strength), Medium Percentage (4-10%), and Low Percentage (<4%). 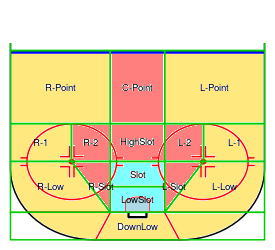 The chart looks exactly like you'd expect it to; as a defender you want to keep the other team away from the front of the net and in the slot and out towards the perimeter as much as possible. At even strength so far in 2014-15, Marc-Andre Fleury finds himself performing well when compared to the rest of the league in High and Low Percentage shots, ranking 9th in High Percentage shots (0.851 save percentage) and 4th in Low Percentage shots (0.981) out of 29 goalies with 1,000+ even strength minutes; however, he ranks just 21st in Medium Percentage shots (0.897). His save percentage is down considerably on Medium Percentage shots compared to the previous three seasons, when he ranked 28th (0.913) out of 56 goalies with 2,000 or more even strength minutes, though he's comparable to his previous Low Percentage production, ranking 7th (0.978) out of 56, and he's improved on the High Percentage shots by an incredible margin as he ranked just 46th (0.805) out of the 56 goalies. Marc-Andre Fleury has been having a career season in goal for the Penguins, and that's including leading the league in shutouts and placing 4th in wins in addition to the stats listed above. While it remains to be seen if he can sustain this level of play, he's surely earned his All-Star bid so far and is giving Pittsburgh a level of goaltending capable of bringing the Stanley Cup back to western PA. With strong play in net, a very good group of defensemen, and a forwards group that looks more and more complete with each passing day, the Pens continue to look primed to make a deep playoff run, and Marc-Andre Fleury will likely be a large part of getting them there.